Should the army be cleaning up South Africa’s rivers? South African Finance Minister Tito Mboweni has a new plan to solve the country’s water infrastructure crisis: send in the army. In his budget speech on 24 October Mboweni said the government was ‘dealing decisively and urgently’ with the water crisis in the Vaal River system. Serious pollution in the river is endangering the lives of up to three million people who depend directly on water from the Vaal. These are especially people in poor communities with no access to clean water and sanitation. The water also flows into the Vaal Dam, which supplies Gauteng – the country’s economic heartland. Mboweni said he was happy to report that the president and the minister of defence had granted approval for the South African National Defence Force (SANDF) to help with ‘engineering and other expertise’ to resolve the problem. ‘The generals in charge have already started working on solutions,’ said Mboweni. The step has been hailed by commentators as an example of decisive action by the government. Journalist Stephen Grootes wrote in Daily Maverick that the announcement ‘shows that government is acting, and acting drastically. In other words, for many people, it is a symbol of how seriously government takes their problem. It is hard to think of a stronger symbol than the sight of soldiers and military equipment literally declaring war on service delivery problems’. Really? While South Africans will agree that service delivery – especially the provision of clean water – should be tackled head on, not everyone agrees that seeing soldiers doing the work inspires confidence in government’s capacity to do its job. Instead, it raises questions about whether effective and lasting solutions are being found. Eric Pelser, head of the Institute for Security Studies (ISS) ENACT programme on organised crime believes that ‘there can be no greater admission of municipal failure than the deployment of the military’. Using the military for civil infrastructure development in Africa is never a good idea, he says. ‘It usually ends in tears – just ask the Ghanaians, Nigerians or Liberians. It starts small, a road here, a clinic there, and then the generals think, we do this well, and it escalates until the generals think they’re better than the politicians’. South Africa’s post-apartheid military is not a threat to the country’s stability, as may be the case in many other African countries. It has never shown any signs of interfering in politics as has happened elsewhere where soldiers are heavily involved in the intimidation of voters, harassment of the opposition and sometimes even coup d’états. Think Zimbabwe. On the contrary, civil society and South Africa’s opposition react quickly to any signs of such interference. In early 2017, for example, the opposition Economic Freedom Fighters accused former president Jacob Zuma of ‘unleashing the army on the people of South Africa’ when it was announced that soldiers would help maintain law and order during the annual State of the Nation debate. Parliament had to quickly respond by saying no SANDF member would be deployed in the parliamentary precinct. Apart from the army’s historical hands-off approach to politics, some question whether the SANDF would even be capable of any real interference. Over the years the defence budget and the capacity of the military have dwindled. 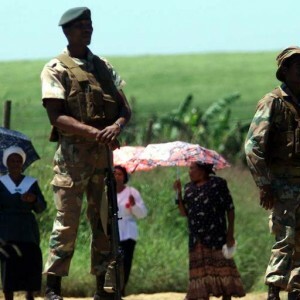 Presently the SANDF is mainly deployed on the country’s borders and in the Democratic Republic of the Congo, with just over 1 000 troops as part of the United Nations force there. The SANDF has in the past intervened in severe national crises such as floods and heavy snowfalls. Recently it helped beef up health systems in the North West province and is also planning to build bridges in the Eastern Cape. The SANDF explained that this was part of ‘Operation Chariot’, an effort to ‘provide humanitarian and disaster relief’ to citizens. South Africa’s constitution allows the army to be deployed ‘for service in the preservation of life, health or property; for service in the provision or maintenance of essential services; and for service in support of any department of state for the purpose of socio-economic upliftment’. But perhaps the question is less about the SANDF’s legal mandate, and more about what this particular choice reveals about government’s capacity to deliver fundamental services, and to fix deep-rooted problems when delivery collapses. ‘We need to avoid a situation where the army is routinely used to step in when municipalities fail to deliver,’ says Pelser. Is using the military for civil infrastructure development in Africa ever a good idea? Working with the Water Research Commission, recent ISS analysis has shown that South Africa loses 36% of its municipal water through leaks from damaged infrastructure and treats less than 60% of its wastewater. Solving the country’s water crisis, the research says, is as much about technical solutions as it is about political will and significant financial investments. This is supported by civil rights organisations such as the Organisation Undoing Tax Abuse and Save the Vaal, who point out that the pollution in the river isn’t due only to the malfunctioning of outdated infrastructure – something the army might be able to fix. It is also the result of inefficiency and corruption in the Emfuleni Municipality, which has been accused of non-compliance with basic service delivery requirements. Following Mboweni’s speech, the SANDF sent a mission to assess the situation in the river, which has been described as ‘criminal behaviour’ because the municipality’s inaction poses a threat to millions of lives. Only after the mission by military engineers will recommendations be made about how to deal with the problem. Mboweni eloquently warned in his budget speech that South Africa might be in a Dickensonian ‘age of foolishness’. Hopefully this does not apply to the plan to send in the army to repair South Africa’s water infrastructure, while other urgent solutions remain unattended.